He struggled in school for a variety of reasons, including lack of effort, poor health, and genuine struggles with some subjects. Also, he was pretty bad at managing the money his parents gave him. 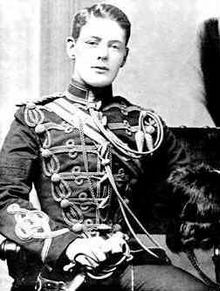 He was largely ignored and/or criticized by his father (Lord Randolph Churchill) and neglected by his mother; he was sent off to a series of boarding schools starting at age 8; he never really lived at home again for any extended period after that. He failed the British Army entrance exam (a very rigorous academic test then) two times and barely passed it the third time. As a member of the British Army, he served in heavy fighting action in India and some additional action in Egypt, risking his life many times. When the Second Boer War broke out in South Africa, he went there as a war journalist, but ended up leading and overseeing troops in the thick of things, again risking his life multiple times. While there, he was captured by the Boers and sent to a POW camp. He escaped by himself and made his way overland some 200 miles (mostly via a cargo train) to British-held territory again. After he was free, he wrote a letter to the Boer commander with jurisdiction over the POW camp, telling him that his [Churchill’s] escape was not the fault of the sentries standing guard, hoping that, by so doing, the sentries would not be punished. Through all this, he not only wrote many dispatches for newspapers about the conflicts in India, Egypt, and South Africa, he published five (5) books — some of which were collections of his dispatches, others his accounts and analysis of the military actions he was involved in. He was subsequently in great demand as a public speaker, including as a paid lecturer in England and America, earning a great deal of money in the process (well over $100,000 in modern currency). At his first lecture in America, in New York City, he was introduced to the audience by Mark Twain. He ended up running for and winning a seat in Parliament, the start of decades of civil service. Impressive, no? Now consider this. He did all that by age 26. A European war cannot be anything but a cruel, heart-rending struggle, which, if we are ever to enjoy the bitter fruits of victory, must demand, perhaps for several years, the whole manhood of the nation, the entire suspension of peaceful industries, and the concentration to one end of every vital energy in the community. . . .
…when mighty populations are impelled upon each other, each individual severally embittered and inflamed, when the resources of science and civilisation sweep away everything that might mitigate their fury, a European war can only end in the ruin of the vanquished and the scarcely less fatal commercial dislocation and exhaustion of the conquerors. Democracy is more vindictive than Cabinets. The war of peoples will be more terrible than the war of kings. This is actually from one of his earliest speeches in Parliament, in 1901, again at age 26.